A chocolate biscuit cake is always a crowd pleaser. This one brings it to the next level by taking inspiration from a traditional gingerbread house with the flavour of gingernut biscuits and decorated with sweets. It’s sure to be a show-stopping centrepiece. 1. Grease a 15cm and 18cm round loose-bottomed cake tin with oil. Line the sides with non-stick baking paper. 2. Snap the milk and dark chocolate into a really large heatproof bowl. Add the butter and either melt in the microwave in 30-second blasts, stirring between each go, or over a pan of simmering water shallow enough that the water doesn’t touch the bottom of the bowl. Once melted, stir in the condensed milk until well combined. Snap the biscuits in chunks into the mixture and stir well until evenly coated. 3. Spoon into the smaller tin first, pressing it down well and smoothing with the back of a spoon to prevent gaps and air pockets. Fill to the top, then repeat with the second tin. Cover both with cling film and chill in the fridge for at least 3 hours or overnight, until set. The cakes can be made a week or two ahead and kept covered in the fridge. 4. Meanwhile, to make the buttercream, snap the white chocolate into a large heatproof bowl and melt as before. Remove and leave to cool. Using an electric mixer, beat the softened butter in a large bowl until pale. Sift the icing sugar over in stages, combining well before adding the next batch. Beat in the cooled melted chocolate until well combined to give a smooth mixture. 5. When you’re ready to assemble, remove the cakes from the tins and stack the smaller one on top of the other on a serving plate or cake stand. Using a palette knife, spread some of the buttercream in an even layer all over each of the wafer cones and set aside. Spread the remaining buttercream evenly all over the tops and sides of the cake until completely coated and smooth. Sit the wafer cones on top, pointed side up. 6. Now for the creative bit! I like to start with the candy canes crossed over at the front as a door to the castle. Stick the remaining sweets onto the icing in whatever pattern or design you like. Kids are going to absolutely love this part of the recipe in particular. Voilà! You have your stunning castle cake. 7. To serve, remove the wafer cones to serve separately. Lift off the top tier and cut each cake in half, then cut each half into 16 wedges. The wedges can then be cut into fingers if serving at a large party. Leftovers will keep for a couple of weeks well wrapped in the fridge. 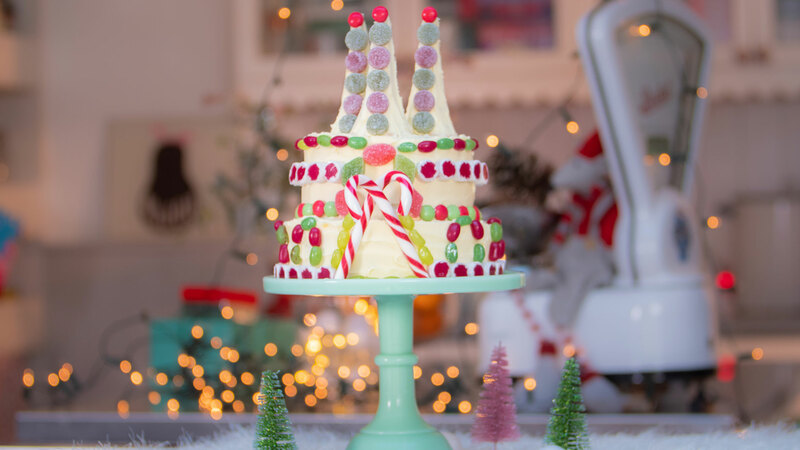 Tip: Halve the recipe (except for the wafer cones and candy canes) if you don’t need such large portions, although the castle effect won’t be quite as dramatic..